Inventor and businessman Albert L. Ide (1841-1897) won international fame as the creator of the Ideal steam engine, which was used in early electric generation systems around the turn of the 20th century. Born in Ohio in 1841, Ide arrived in Sangamon County with his family as a two-year-old. He grew up near Williamsville, where his father farmed and taught school. As an adult, Ide was to be praised as “a natural genius, a mechanic of the highest order,” and he showed his mechanical bent early. As a boy he amused himself making a toy cannon out of wood (it exploded) and repairing the neighbors’ clocks. Upon leaving school at 15, he was signed as a machinist’s apprentice in the Springfield shop of Campbell & Richardson. 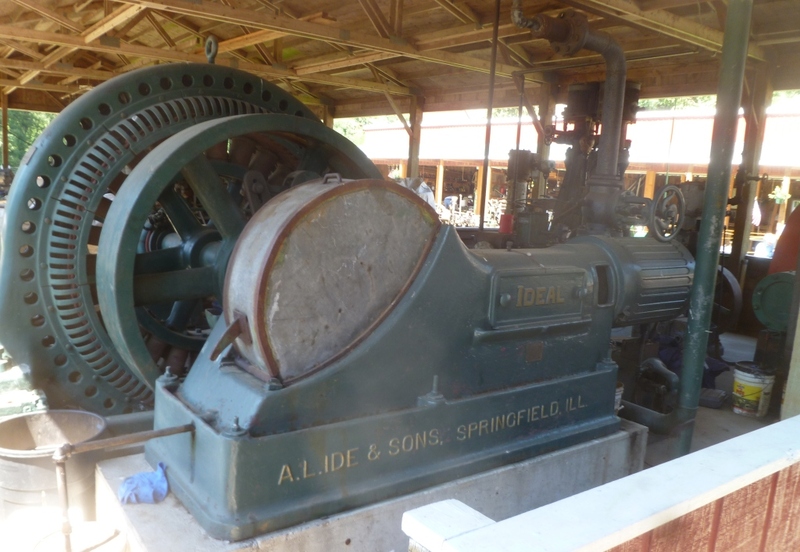 The firm built steam engines for saw and grist mills, a training that would stand Ide in good stead. Ide served in the Civil War with the Seventh Illinois Infantry and later the 32nd Illinois Infantry. (Enlisting as a private, he was discharged with the rank of major after being debilitated by typhoid fever.) Upon leaving the army, Ide clerked in a store, then used his savings to purchase an interest in the jewelry business of Henry C. Meyers, of which be ultimately became the sole owner. Retailing was not Ide’s forte, and he was able to again indulge his interest in mechanical systems when he superintended the building and equipment of the Fifth Street Line of the Springfield City Railway Co., where he eventually became president. In 1870 Ide opened his own steam-fitting business in Springfield, and Ide’s Machine Works secured the contract to furnish the heating apparatus for the new Illinois statehouse. Such was the firm’s success that in 1876 he purchased the old city Market House at Fifth and Madison Streets and converted it into a machine shop and foundry. There the firm manufactured steam pumps, radiators, pipes and fittings, boilers and steam engines, as well as ornamental lamp posts and manhole covers. Ide next turned his attention to commercial artificial lighting. In 1881, he installed the first electric light generator in Springfield to demonstrate arc lights. The results, while dazzling, were not dependable, and Ide traveled to the Menlo Park laboratory of Thomas Edison about 1880 as part of his study of the new technology. The chief drawback of the systems then in use was fluctuations in the speed of the engine used to drive the generator, which caused the resulting light to waver in intensity. Existing systems to govern the speed of such machines were unsatisfactory, Ide concluded, so he began to perfect his own. In 1881, Ide took the lead in forming the Springfield Steam Supply and Electric Light Company (later Springfield Electric Light & Power). As a demonstration, using an Ide-powered generator, the company that July installed 10 arc lights on the courthouse square and in several downtown businesses. The company would continue to provide most of Springfield’s power for another decade. More tinkering led to an automatic high-speed self-oiling steam engine that Ide patented in 1884. (He would take out another 11 patents on the device over the next six years.) He named it the Ideal – a rendering of “Ide, A.L.” – because its steady operation made it perfect for electricity generation. The Albert L. Ide & Sons Engine Works was added to the Ide factory complex at Fifth and Madison and soon employed more than 100 men. The Ideal was quickly in demand for use in power plants being installed in public buildings, streetcar lines, and large hotel and office buildings in the U.S. and abroad. While intended for light generation, the machine was adaptable to other uses; the St. Louis Globe-Democrat powered its new printing presses with Ideals. Like so many Springfield industrialists of the period, Ide was active in a variety of enterprises. In addition to being the senior partner of A. L. Ide & Sons and president of the Light & Power Company, he was a director of the Ridgely National Bank and of the Springfield Consolidated Railway Company. Ide lived with his wife, the former Adelaide Pierce, at 1515 N. Third St. They had five children, of whom three – Harry L., Francis P. and Roy W. – worked as members of the family firm. Ide worked until the day he died, only 56, on Sept. 6, 1897. The sons continued the firm with some success. The former Springfield High School, then located next door at Fourth and Madison Streets, had been abandoned because of train noise, and the firm acquired it and expanded the foundry. Ide & Sons made castings there for engines used by such major local manufacturers as Sangamo Electric. However, the day of on-site steam-generated electricity was drawing to a close. In 1924, when the Ide factory was struck by lightning and burned to the ground, the sons decided not to rebuild. Note: This entry has been edited to correct the chronology of the beginning of electric lighting in Springfield. For more on that subject, see First Electric Lights. Historical Encyclopedia of Illinois and History of Sangamon County, edited By Newton Bateman and Paul Selby. A. M. Munsell Publishing Company, 1912; pp. 1334-36 (readable online). High Speed Steam Engines by William Norris, Benjamin H. Morgan, P.S. King and Son, 1902. This entry was posted in Business, Industry, Prominent figures. Bookmark the permalink. Today, I was taking pictures at the Whatcom County WA Steam and Antique show and my wife pointed out that the Ideal engine we were looking at was built in Springfield. So I took a picture of it. If you were to send me a e-mail address, I would send you a copy of the photo. Chuck: I’d love to see it: mkienzler@msn.com. Thanks for reading. Would you be able to send the photo to me also. Very interested. I found the actual blueprints of the “Ideal Engine” in an attic in Springfield. They are dated 1887. Ms. Lewis: I’m responding to you via email. Thanks for reading. Still trying to hear from T. Lewis. My great aunt was Mrs Roy William Ide. Do you still have blueprints of the Ideal Engine. Looks like its been a while since any one has looked at this web site. I’m hoping someone will respond to me by phone 217-851-1655. My name is Lori, my mother was a caregiver to Albert Ide’s grandaughter. I have the original picture of the parrot photo. I have some amazing stories and items gifted to my mother who has now passesd. My goal is to seek out Ide collecters to honor the family. Lori: We here at SangamonLink would be very interested in any stories you know of about the Ide family. If you want to pass anything along, my email address is mkienzler@msn.com. Thanks for the note. I just ran across your request. My great-aunt was Mrs. Roy William IDE. I’m interested in stories, photos, blueprints, etc.